← POW! The Marky Mark Workout! Next month, the guy known as the “Guide of the First of September Great Revolution of the Socialist People’s Libyan Arab Jamahiriya” will be making his first-ever appearance on U.S. soil. The world’s third-longest-serving national leader has come a long way since the 1980s, when the Americans bombed the bejesus out of his abode. 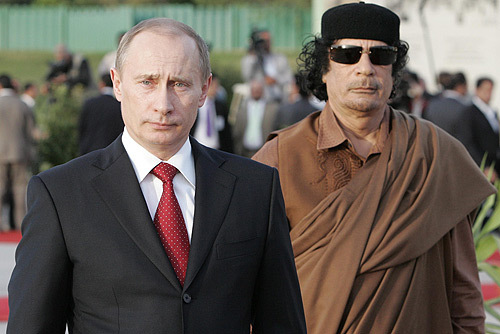 That’s right, folks, Muammar al-Gaddafi is about to make his first diplomatic trip to American shores. ROTI previously reported on Gaddafi’s penchant to bring a gigantic tent with him where ever he goes. The conventional treatment for a visiting head of state is five-star accommodation and a fleet of limousines. This one brought his own tent and camel. Security might consist of some hefty male bodygaurds and strategically-placed marksmen. This VIP brought 30 blue-uniformed females, all supposedly virgins. 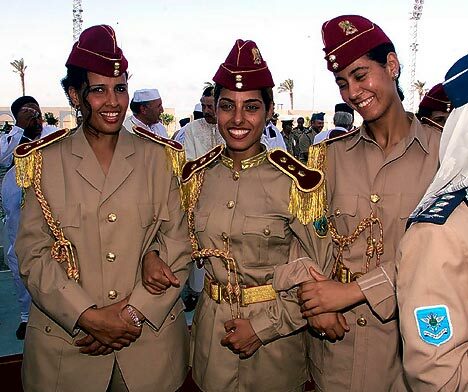 Don’t be deceived: The Libyan leader’s female guards are trained to kill. Few of the orthodoxies of a state visit remained unchallenged as Colonel Muammar Gaddafi breezed into Paris in his Bedouin robes yesterday. His 400-strong entourage arrived on no fewer than five planes before heading to the Hotel de Marigny, where the Libyan leader will pitch his heated tent in the grounds. He was said to be bringing a Saharan camel with him in order to “greet visitors in the true desert tradition”. 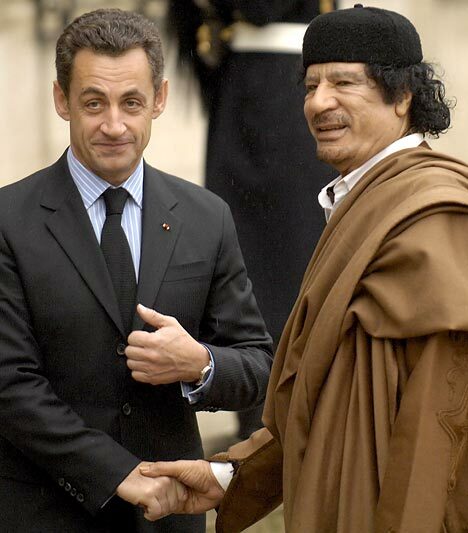 How hilarious is this picture of Sarkozy? Have you noticed that he is always around when world leaders are up to sketchy business? First he joined Obama in peeping some Brazilian booty, now he’s hanging out with Gaddafi and his killer virgin posse. Next thing you know, Gaddafi takes his killer virgins tour to the USA. “Did you see those killer virgins, bro?! Rome has had its fair share of triumphant parades by bizarre tyrants in its long history. And the ageing Libyan leader Colonel Muammar Gaddafi’s arrival on Monday ranked alongside any grotesque ceremony staged by Caligula or Nero. 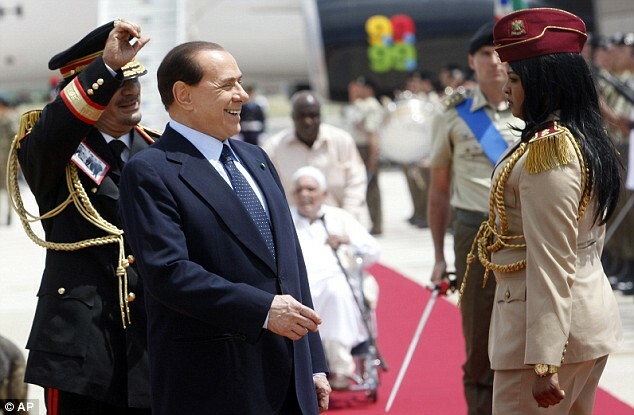 It is easy to see why Italy’s Left-wing opposition denounced the dictator’s reception by Italian premier Silvio Berlusconi as a ‘rock star welcome’. 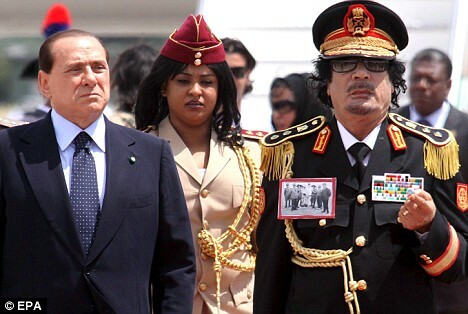 Gaddafi’s arrived in Rome with a 300-strong retinue on three Airbuses. As ever, he brought with him a giant Bedouin tent, which was erected in a park in the centre of the city and where he was to stay and conduct business. There was no immediate sign of the camel he took on a visit to Paris in 2007 when he pitched his tent in the grounds of a five-star hotel. With gelled and carefully dyed hair, the Colonel was made up to look like a cross between Michael Jackson and the deranged music mogul murderer Phil Spector. Pinned to his chest was a large photograph of a Libyan resistance leader being hanged by Italian colonialists in 1931. Although with his peaked cap, red flashes, gold braid epaulettes and an array of military decorations that resembled a Dulux colour chart, he turned out in a uniform that Italy’s last tyrant, fascist leader Benito Mussolini, would have killed for. But it was the gun-toting female bodyguards in their khaki uniforms and red berets in the 67-year old dictator’s entourage, girls who wear Kalashnikovs like Gucci fashion accessories, who stole the show. Gaddafi is one of the maddest dictators on Earth and he doesn’t like being upstaged – unless it’s by this 40-strong troupe of well-equipped, all-virgin minders. The dictator, who calls himself a pioneer of ‘Islamic socialism’, doesn’t let his female security detail hide their charms under a burqa. The all female bodyguards, along with their khaki uniforms and red berets, wear lipstick, jewellery, and even high heels – but are trained in armed combat. All 40 guards are virgins, and he insists they remain so. Gaddafi’s girls have become an internet sensation with websites dedicated to them. Not that Gaddafi is likely to mind the furore – he once famously passed wind the whole way through an interview with John Simpson. 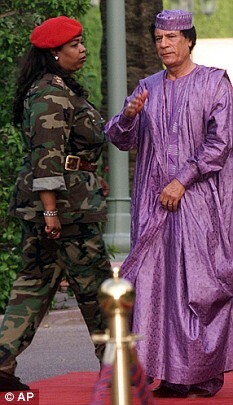 Bizarrely, Gaddafi claims they are a symbol of his belief in female emancipation. “Women should be trained for combat, so that they do not become easy prey for their enemies,” he is reported to have said. When I was growing up in the 80s, Gaddafi was one of the ultimate bad guys. Reagan was always trying to kill him and he was usually sponsoring some kind of vile terrorist mess. After September 11th, he got pretty freaked out by the GWOT and all of a sudden changed his ways, I guess. Next thing you know, Gaddafi has transformed from wicked enemy of freedom into one of the world’s most wacky leaders, seemingly harmless and awesomely entertaining. Many are protesting Gaddafi’s U.S. visit, outraged at his past support for terrorist killers and trying to deny him landing spots for his Bedouin tent. An Orthodox rabbi who lives next to the Libyan estate said he plans to gather local residents at his home Sunday for a protest against the possible Gaddafi visit. Haters…please give it a rest.